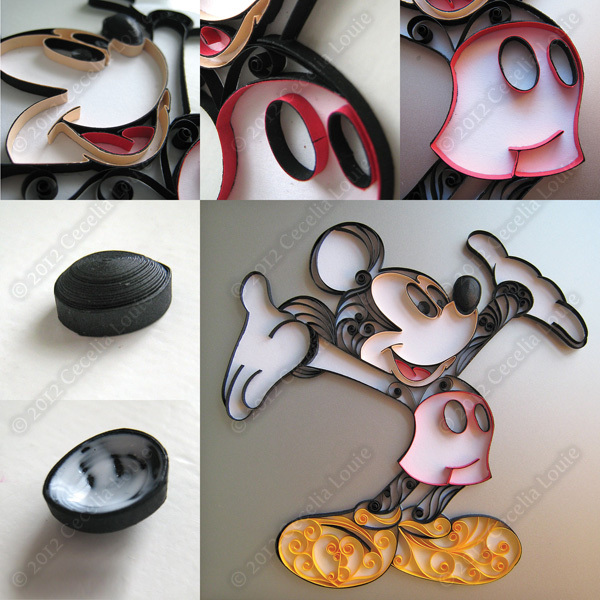 This is a birthday gift for a girl who is fanatical (way beyond being a fan) of Mickey Mouse. She makes me laugh even while I’m crying, which is just one of the magical things about her. Here’s how I started Mickey: 1) Traced and cut Mickey’s outline. 2) My sketchbook of how I imagined shooting out fireworks from his hands. 3) As I curved each strip with 80lb cover thick quilling paper (I cut my own), I’d put it aside to glue at one time. 4) Using a light table helped me see where some lines travel from outside into his body. 5) Even a small amount of error would show. 6) Had to cut the corner to trim off excess to fit. 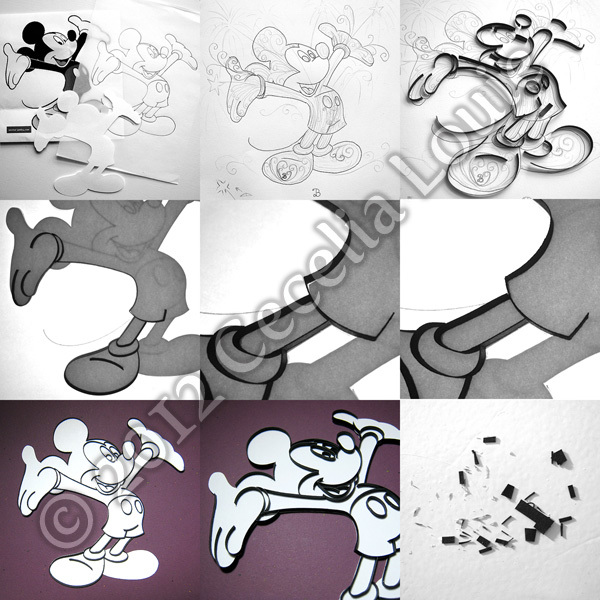 7) Completed Mickey outline. I had left the hands undone, to allow fireworks dictate paths. 8) Side shot of outlined Mickey. I used a black felt to shade in the thin white backing that sometimes peeked out from the side. 9) Just a few scraps of paper from the “cutting room floor” as each strip was made to fit. I had initially hoped to quill something remotely like Yulia Brodskaya’s with movement, but as I went along I realized Mickey is so definitively Mickey, and to insert lines where the artist did not draw them kind of took away from Mickey – especially his shorts, which just kept looking like striped pjs! It took an hour just to fill the left shoe with her initial “B”. As I finished his shoes I realized how much the color along the sides glowed almost neon-like into the white backing and realized I didn’t need to fill in his face or shorts after all. I decided not to quill in them at all, and instead applied glue to each “wall” and pressed the quilling paper against the black. Since the black outline was made of thicker paper, it could withstand that much pressure – I don’t think a regular thin strip could manage so easily. 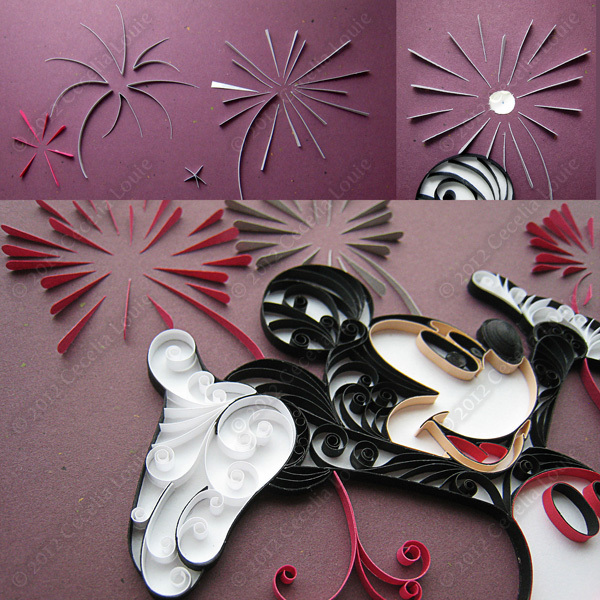 I used tweezers to ensure tight corners and pre-softened my quilling paper beforehand by giving it a soft curl. Here are some experiments with fireworks. In the end, I cut out long teardrop shapes on my Silhouette die cutter and enjoy the dimension they add when seen from the side. I used a hole puncher to cut a circle from a post-it note and inked in a center dot. This helped me visualize the center as I glued each spark in place. After much debate (my poor hubbie), I decided to have the fireworks stream up on their own accord rather than from Mickey’s hands. I simply ran out of room (I had already bought the 8×8 frame and it was the day of the birthday – gulp!). 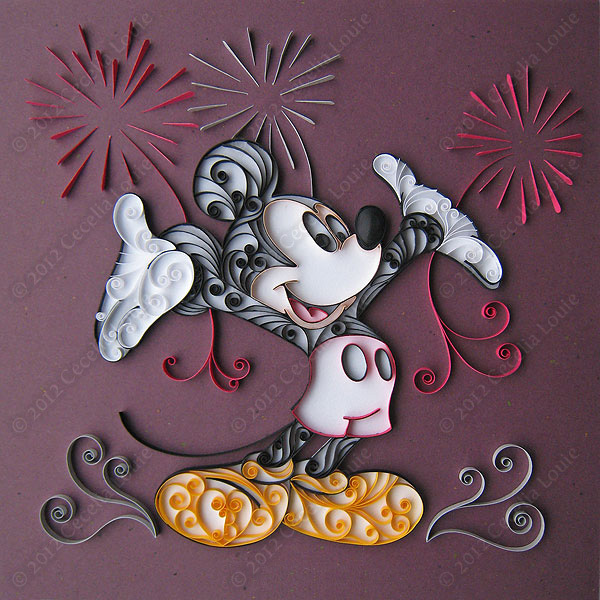 Admittedly, Mickey kind of looks like he’s had a tattoo job, but I was really striving for a “magical” kind of outfit – ah well, next year… The fireworks paper was metallic Stardream in a text weight. Cecelia, how fantastic is this. I can't stop looking at it. Your work is so NOT 'far from perfect' that it is BEYOND perfect. thanks so much for showing us your work. How wonderful this is !! This is such a fun way to do cartoon characters. Hope to try some myself. Thank you again Pritesh! Your comments always make me smile :D Thanks also for showing my work on your popular Facebook page! That's awesome Pritesh, thank you! I'm very honored to be alongside such amazing talent in your list - I've never seen their work before and was simply blown away. As I started thinking of who to pass along the award to, I realized I've been admiring sites with over 200 followers. I will definitely make an effort to be more aware so that I can also pass along the award. Thanks so much Annie, happy to hear you're following my blog! This looks great! I like it. So cute and beautiful quilling - just the right amount if you ask me. :) I especially love the touch of the teardrop shaped fireworks. So, so cute! Lovely quilling! Thanks for sharing! What an amazing creation a stunning masterpiece. So much work you have put in and Thank You for showing the steps-- always makes it look so wonderful when you know how it was made! What a beautiful piece of art! Etsy or some other store is the place for you because I know I would definitely buy one! Ps. I love so very much the Valentine card (Ying and Yang)and I succeed to make one,myself .Thank you so so much !!!!!!!!!!! Beautiful!! Beautiful work and beautiful colors! Would you make one to sale it? It took over 20 hours to quill Magical Mickey for a dear friend and I hadn't planned on making them to sell. Thank you and everyone for such wonderful compliments - I've been so pleased to read them this week. It's great. There have been so accurate. Congratulations. Just discovered your blog. Wonderful job. How long have you been quilling? I think I started around 2006 when I found the Klutz Twirled Paper book, which showed me quilling is not grandma art. Your blog has wonderful tutorials for protraits! Your blog is very interesting and informative. Thanks for sharing great art and ideas! Hi Seylani, thanks so much! You've made my day. I'm thrilled to have inspired you. This is so beautiful. I am attempting to copy your technique to make a gift for a friend. Any advice for me? I have my image traced, cut out and I'm ready to start outlining. I'm a little nervous to begin! What kind of glue do you use for quilling? And how did you get the paper to stay right at the edge of your cut out? Any advice you might have would be amazing. I use Lineco Neutral pH Adhesive because it's thicker and acid-free, unlike the typical watery stuff. I bought mine at an art supply store. The paper edge for Mickey was 80 lb cover weight - much thicker than normal quilling paper. Since the curves are so open and wide for outlining, it was OK to use such heavy card stock - or else it buckles with tight curves. To make the edge follow my cut out I gently curled it, placed against the tracing, then kept curling until it followed the tracing. When I went to glue, I did it slowly, making sure the edge placed as closely as possible. Don't forget - I had to hide some of the white edges with a black marker. Take lots of breaks in between sections. Get off your chair and swing your arms around and stop being hunched over. This took over 20 hours so pace yourself and don't forget to enjoy quilling! 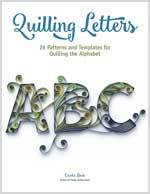 I'm so glad to see quilling coming back! I love to quill and was wondering where you found his image? I've googled it and haven't seen a satisfactory image as good as yours. Any help would be greatly appreciated thank you!! I, like everyone else, thinks this is the mmost beautiful Mickey card I have EVER seen! Great job! Thanks for sharing! Thanks very much Kathryn! I think little details like that make a customized gift truly unique to the receiver. Hi srontanini, I'm sorry but my Mickey was a gift. I won't be making another one. Congrats on your new place.